What is the true significance of Jiddu Krishnamurti’s thought and writings? 12) While discussing in his lectures and writings the problems faced by our humanity, he does not seem to appreciate some basic factors in human evolution, such as Democracy, Ethics, Human Rights or the Organization of the United Nations. On the other hand, he shows a fine perception of the unity of life in Nature. 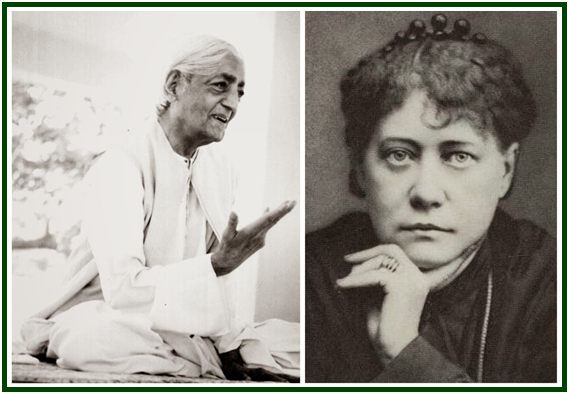 In spite of a few points in common with Theosophy, Jiddu Krishnamurti actively ignores most of the theosophical teachings, and openly contradicts many of them. He is the surprising “avatar” who despises thought and the work of the brain. How could one understand such an attitude from a theosophical point of view? Krishnamurti is an adversary to mechanical forms of thought and emotions based on personal memory. In this he seems to be right. The lower self thinking which Krishnamurti denounces is cold and astute. It is governed by attachment and rejection. It has scarce ethics and cannot intensely relate to noble feelings. Selfish thinking is often soul-less and seems to dominate the surface of life in our civilization. Egotistic mind operations generate an instinctive rejection in citizens of good-will. Some individuals, then, convince themselves that the very act of thinking is false, wrong and despicable in itself, and try to deny the legitimacy of each and every form of thinking. All mental activities are considered by them as worse than useless. Such an inaccurate and pessimistic criticism is more than self-defeating. It is less innocent than it looks. By labeling the process of thought in itself as inherently bad, some “Krishnamurtians” may unconsciously give themselves a sort of license to think along selfish lines, and thus blindly oscillate in their lives between egotistic thoughts, on one hand, and a “mystical negation of all thought”, on the other hand. If they would accept the fact that human beings can indeed think in correct ways, they would have to make an effort in that direction. They prefer to avoid that. Jiddu Krishnamurti fell in the illusion that thought is bad, and began to proclaim and promulgate it. Teaching an apparently easy path – that of mystical laziness at the mental plane – his books have taken thousands of readers to the occult trap which consists in despising reason. Many of his followers get caught in the blind alley of the cult to thoughtlessness. What then should citizens of good-will do, who want to live up to the next step in human evolution? They must choose a more difficult path, which goes upward, in the direction opposite to the thoughtless road recommended by Krishnamurti. One must expand, not reduce, the relationship between one’s thoughts, emotions and actions. Despising the process of thought would only cause harm to Antahkarana, that sacred bridge that links the higher self and the lower one. It is by establishing a stronger correspondence between ideas, feelings and acts that a human being provokes an intense presence of his higher self in daily life. One must love that which one thinks. One must rationally understand that which one loves. Right thought needs sincere emotions. Truth is perceived by the highest levels of thought. Correct thinking flows in harmony with inner silence, and from this harmony right action emerges. Although meditational states of mind transcend thought, they do not deny it. Theosophy stimulates correct mental operations. One must learn each lesson fully, before passing on to the next level of challenge. It is right thought that allows one to transcend and to go beyond the thinking principle. An initial version of the above Chapter was published in Portuguese language in February 2013 under the title of “Krishnamurti e a Teosofia”. It was also published in English in the February 2013 edition of “The Aquarian Theosophist”, pp. 1-3.